At the dawn of magic, three individuals were singled out as possessing the most sin, and a curse was placed upon them. The Phantom Stranger, forced to betray those who trust him in order to gain his freedom. The Question, wiped of all memory, able to discover every answer except the one of his identity. Pandora, doomed to eternal wandering for the crime of curiosity. Each blames the others for their plight, and they've spent centuries as immortal enemies. But now an evil force has risen that will drive them to become uneasy allies. The demon Nimraa has returned to snuff out the light of the world and replace it with an ancient darkness. To stop her, this Trinity of Sin will have to combine their powers and talents. They will have to move beyond their hatred and distrust of one another - but first, they will have to find faith in their own virtue. Writer J.M. 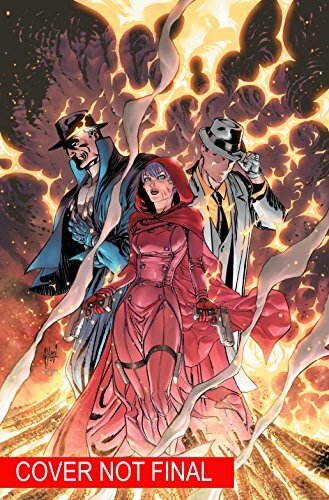 DeMatteis (PHANTOM STRANGER, JUSTICE LEAGUE DARK) and artist Yvel Guichet (STORMWATCH, AQUAMAN) turn the world's greatest sinners into its greatest champions in TRINITY OF SIN: THE WAGES OF SIN (collects issues #1-6).